More news just in from the Oceanstyle team as I'm told that the Palma office has signed the central agency for Ferretti's 29m Custom Line Gemini. Gemini has seen only one owner and captain since new in 2004. No expense was spared in the upkeep and maintenance programme of the yacht and in excess of €1 million was spent on extras, some of which include rain-head showers in all cabins, electric blinds in the saloon and a full aft deck sunshade enclosure. The owner’s cabin on the main deck, enormous garage to stow all water toys and overall interior volumes make Gemini an ideal family yacht. 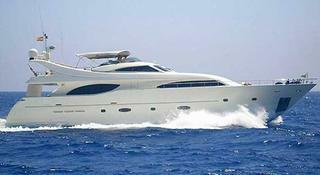 There is also a VIP and two twin cabins giving total accommodation for eight guests. This superyacht is lying in Palma de Mallorca and is asking €3.45 million.